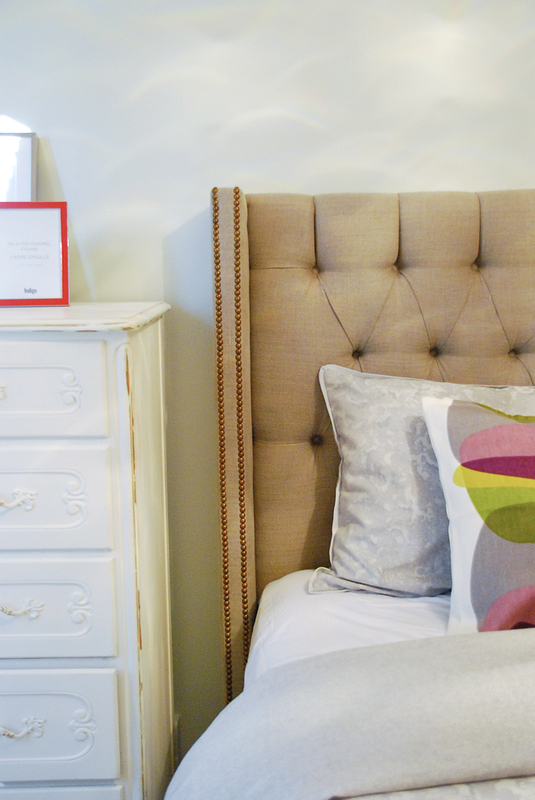 #RockTheRental: Custom Headboard & Giveaway! THIS PROJECT SPONSORED BY SWITCH STUDIO. Time for a #RockTheRental update and a giveaway too! 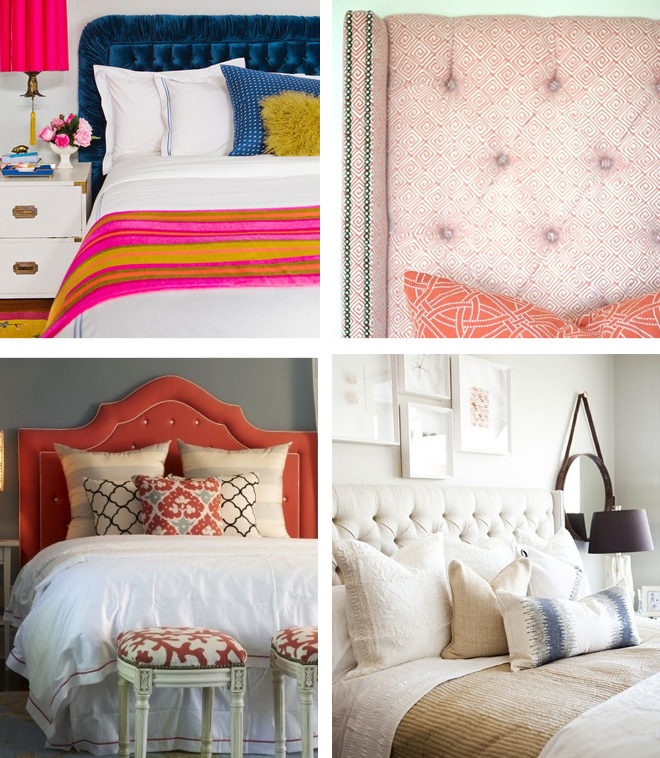 Today we're talking headboards. 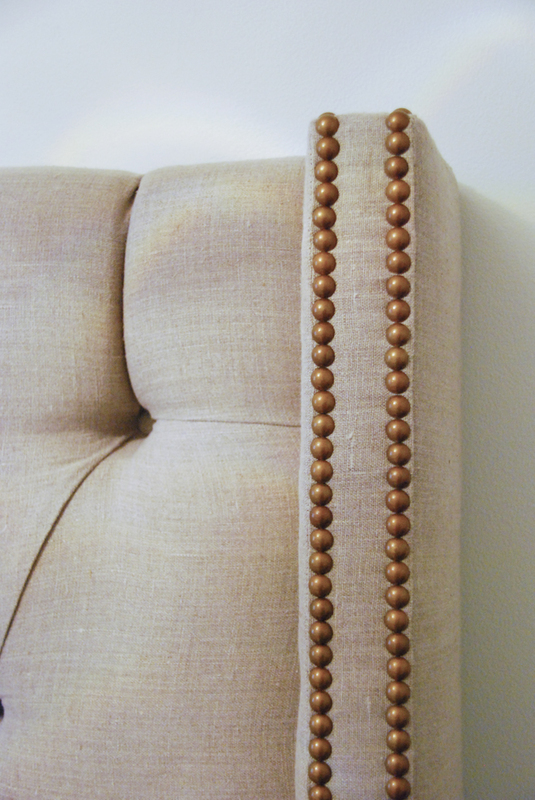 When I put the design scheme for my sister's bedroom together, I knew that the headboard would be the focal point. I approached my friend Staci at Switch Studio to see if we could collaborate on this important piece. Staci is a fabulously talented upholsterer and she can custom-build or transform any upholstered piece you can dream up. Have a look at her impressive portfolio and you'll see just what I mean. Staci was up to the challenge so I packed up fabric and paint samples of other items going in the bedroom and headed out with my sister to Staci's shop in Oakville. The style I envisioned, a modern wingback, would be dramatic and eye-catching. It was important that we get the right fabric for the design. 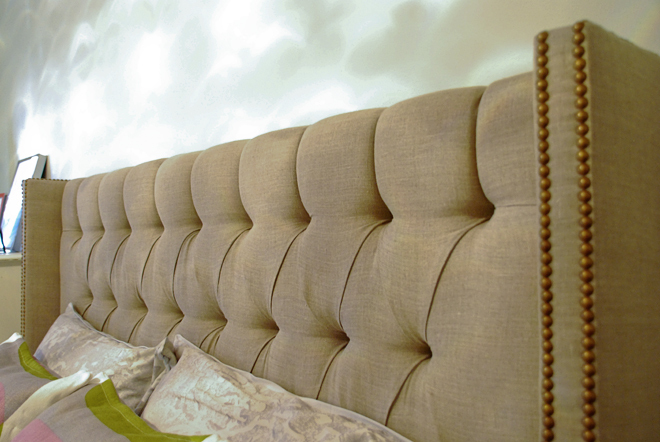 There is lots of inspiration for headboards out there - velvet, patterned, classic, bold colour - we considered it all. We started by thinking about what would work with the other fabrics in the room... the blue-gray floral on the bottom of the pile was originally planned for the curtains and the light green paint (Para Paints Eyelet SR33) was already on the walls. Since the headboard would have tufting, Staci suggested that a solid fabric would work better and show off the tufts more. 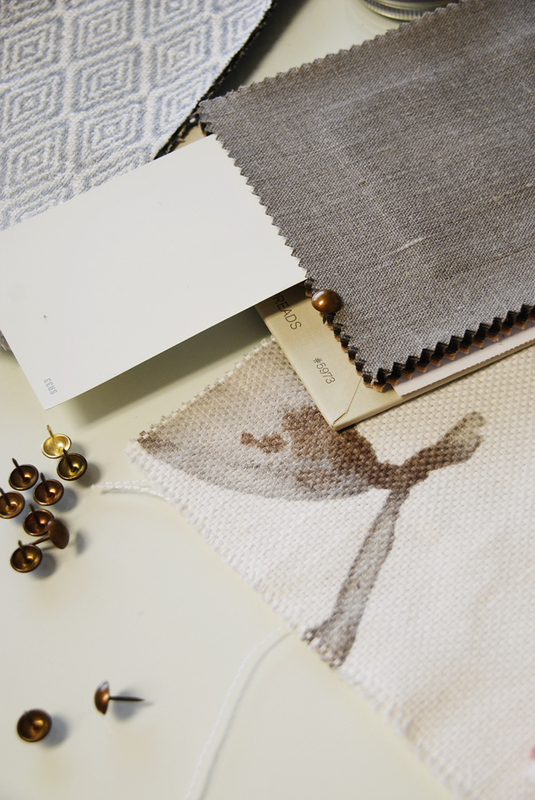 We eventually landed on this palette: an oatmeal coloured Kravet linen, paired with antique brass nailheads. So divine! It would have a slight masculine feel which would balance with the more feminine floral fabrics in the bedroom. 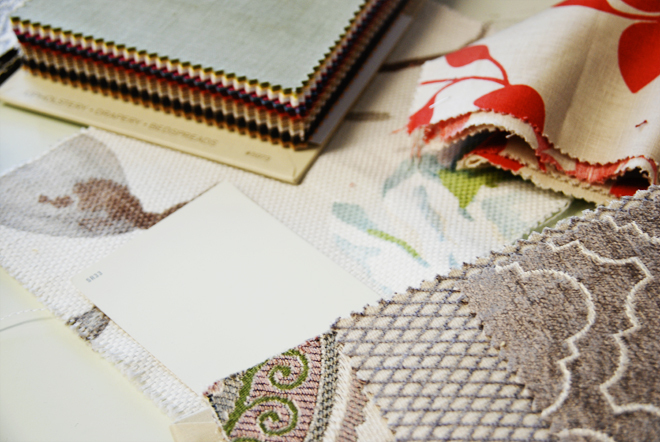 We thought that this fabric would be more timeless too and could move from this apartment into a future home easily. Oh. My. Gosh. Just look at that yummy linen headboard! Can I tell you that I was completely jealous this headboard was my sister's and not mine? Ahhh! It is so so pretty. 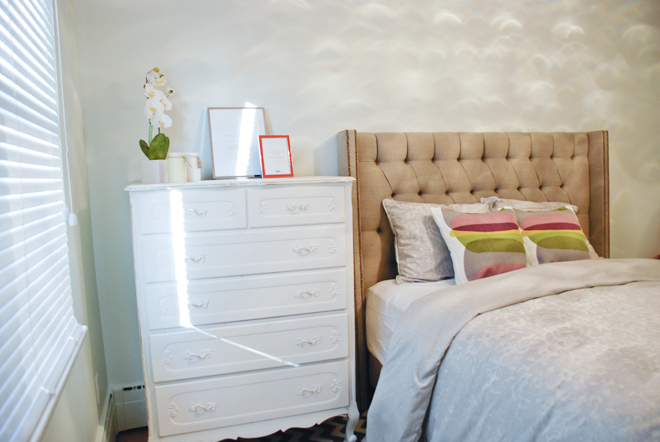 You can buy ready-made headboards or DIY your own version, but this is where the skill of a professional shines through. I love the rich colouring of the nail heads and their perfect placement. And can we talk about those tufts? They are deep and aligned and the pleating is amazing. We were completely thrilled with how this piece turned out. 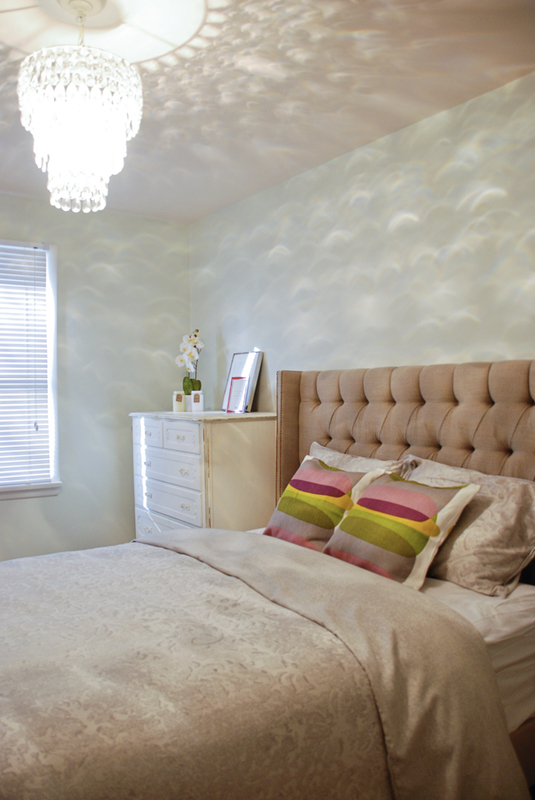 Paired with the glam chandelier (found on ebay for half price), it makes this bedroom feel so very luxurious and sophisticated! Who says a rental should look simple? There is still more to do in this room, but the headboard is without a doubt the most exciting element. And now for something exciting for you... Staci is kindly offering a giveaway of $100 towards any of her services or towards her shop - reupholstery, cushions, custom furniture, and so much more! See below for the many ways to enter. The winner will be randomly selected on April 10th. Good luck!